Located in Plymouth, Massachusetts, Tidmarsh Farms was a cranberry bog for nearly a century, producing up to 1 percent of Ocean Spray’s entire annual harvest. Over the last few decades, the technology of cranberry farming has changed, leaving many coastal farms – including Tidmarsh – struggling. Inter-Fluve worked with project partners to design and construct 20,000 feet of stream channel; 250 acres of fen and Atlantic white cedar bog; reintroduced sphagnum; and removed a 20-foot-high dam. 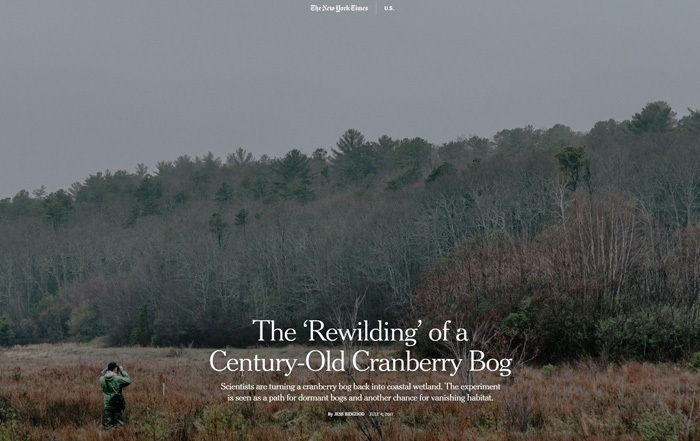 Check out this July 2017 article in the NYT titled The ‘Rewilding’ of a Century-Old Cranberry Bog.